Whether you manage one store or one thousand stores across multiple states, you have many priorities that compete for your time and attention. It’s a job that I do not envy, but the good news is that technology can make your life easier. 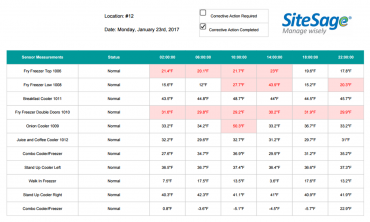 Without a doubt, an internet-connected Asset and Energy Management System like SiteSage can help you proactively avoid equipment performance catastrophes before they happen. However, I’m not the first one to recognize that the question, even for mission-critical assets like HVAC and Refrigeration equipment, isn’t “will it break?” but “when will it break?” You’ll also need to adjust equipment controls for different seasons and guest preferences. And of course, there are always your guests, your many required business processes, and any number of other things competing for your attention. Operating a business is stressful! In this post, I want to explore how technology can free up your time, and help you better work through stressful situations when they do (inevitably) pop up. Let’s say you’re serving up plates of delicious nachos on a busy Friday night at your full-service restaurant when a guest loudly complains about the temperature in the bar. Forget the fact that your guest is wearing a long sleeve hockey jersey and winter hat to support their team despite the ongoing heat wave… you want to adjust the thermostat to keep folks happy and comfortable. Would you rather have to scurry back to the office, thereby leaving beer orders temporarily unfulfilled, while you try to remember how to adjust your thermostat built in 1950, or simply pull your smartphone out of your pocket, and make a quick adjustment via an App? 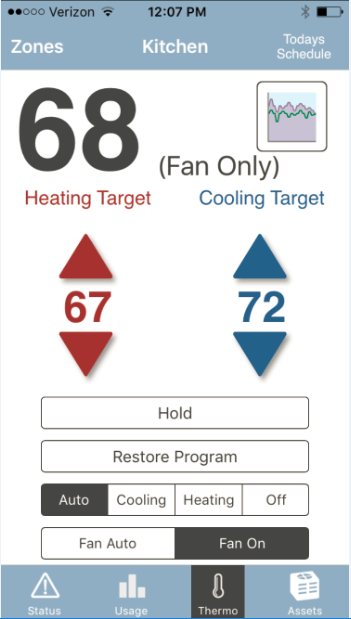 Connecting thermostats to the internet is a best practice because it allows temperature target tweaks to be done quickly and on an intuitive interface, without having to remove yourself from your other duties. You can even show the hockey fan that you made the change right then and there, and that the ESPN app just let you know that his favorite player has been traded. It never ceases to amaze me when product deliveries show up at the most inopportune times. If you’re the manager of a C-store and your assistant manager is nowhere to be found, guess who needs to check the new inventory rolling off the truck? By the time you emerge from underneath the 2-story high stack of snack goods boxes, you realize that you missed your 2 pm Food Safety check mandated by corporate and reviewed by the health department. Or did you? 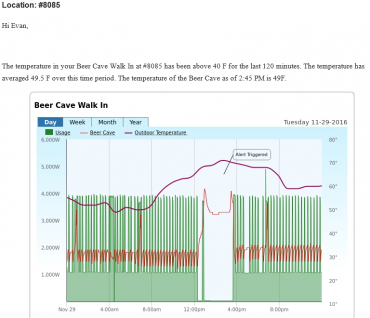 Fortunately, technology has your back and will automatically take the temperature in all of your refrigeration equipment and electronically record it for safe keeping. It’s best practice to automate as much of your food safety monitoring program as possible because, unlike humans with a clipboard, technology never misses a reading, never takes inaccurate measures, and is recorded electronically for better record storage and visibility. As it turns out, sweaters don’t sell well in your retail store in August when the A/C is on the fritz. So when the dressing room area is running warm and stress has your temperature running high as well, you reach out to experts for some advice. You review EMS data over the phone, because even though EMS data and alerts are easy to follow, a second opinion from an expert will put you at ease and in the best position to decide what to do next. 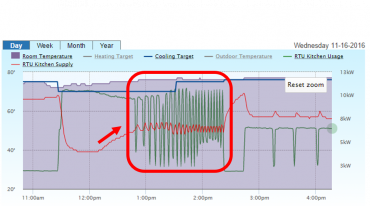 Data from energy monitoring, thermostats, and supply duct temperature sensors reveals that RTU2 is in fact not cooling properly and that a visit from an HVAC tech is the next move, and in the meantime you lower the target temperature for RTU1 to compensate a bit and keep those sweaters moving off the shelf. For organizations that do not have deep EMS and HVAC knowledge in-house, best practice is to hire a Managed Services team that can be reached easily and that can guide your team through stressful situations and make data-informed decisions. Your core business is not managing your equipment, it’s serving your guests and selling your product. Wouldn’t it be great if you spent less time on equipment investigations, adjustments, and processes that technology can do quickly and reliably? Reach out to Powerhouse Dynamics to learn how SiteSage can help you, your operators, and your business. © 2017 Powerhouse Dynamics. All Rights Reserved.